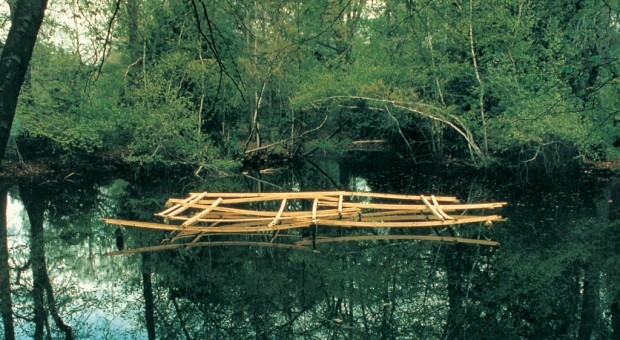 Throughout the 1970s and 1980s Michael Singer’s outdoor sculpture projects opened new possibilities and contributed to the definition of site-specific art and the development of public places. Singer has participated in a number of the most important exhibitions of the past thirty years including the Guggenheim’s “Ten Young Artists Theodoron Award Exhibition,” “Documenta 6,” The Kunsthaus Zurich’s “Mythos and Ritual,” “Sculpture in the Twentieth Century” in Reihen, Switzerland, The Walker Art Center’s “Sculpture Inside Outside,” and The Museum of Modern Art, New York City “Primitivism in the 20th Century.” He had several one-person shows in galleries and museums, most notably “Michael Singer” curated by Diane Waldman at the Guggenheim Museum, New York City. First Gate Ritual Series 5-76. 1976, oak and fieldstone. Nassau County Museum of Fine Art, Roslyn, New York. Glades Ritual Series / Cypress Domes. 1983, bamboo, phragmites, jute rope. Everglades National Park, Homestead, Florida, Sponsored by The Ringling Museum of Art. First Gate Ritual Series 4/79. 1979, (midday clear, midday cloudy) bamboo, phragmites, jute rope. DeWeese Park, City Beautiful Council, Dayton, Ohio. Ritual Series 5/79. 1979, spruce branches, jute rope, oak, phragmites, fieldstones. Wilmington, Vermont. Tomol Ritual Series. 1987, pine fieldstone. Santa Barbara Botanical Garden, Mission Canyon, Santa Barbara, California. Sponsored by the Contemporary Art Forum of Santa Barbara.